Mr. Anshul Saraswat, Assistant Prof.
Mr. R K Mohanty, Assistant Prof.
Mr. B.D. Kaushik, Assistant Prof.
Mrs. Jyoti Sharma, Assistant Prof.
Mr. Amit Sharma, Assistant Prof.
Mr. Vineet Kaushik, Assistant Prof. 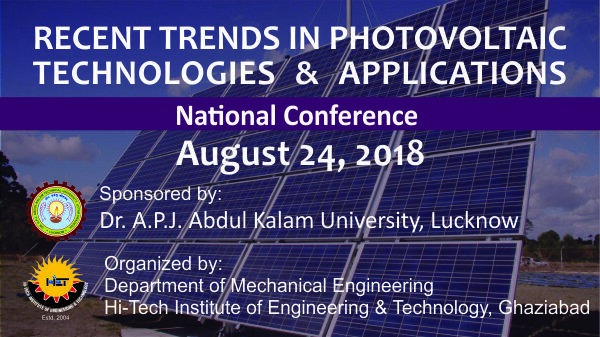 Oral and poster presentations are being invited for the national conference to be held on 24th August 2018 on the topic “Recent Trends in Photovoltaic Technologies and Applications”. Manuscript body: Must include introduction, materials and methods, result and discussion, conclusion, references. The duration of oral presentation will be 10 minutes followed by question answer session for 5 minutes. (The space provided for poster presentation will be 1×1 m2). Original contributions and review papers based on theoretical research, simulation, experimental work, design, development, testing and measurement are solicited for oral and poster presentation in conference. The scope of the conference includes, but is not limited to, the topics viz. Solar radiation modeling, Photo voltaic systems, Solar cell materials, Photovoltaic system design, Photovoltaic-Thermal Systems etc. Hi-Tech Institute of Engineering and Technology (HIET), is one of the premier institutions in the field of technical and management education in NCR region, Ghaziabad. Hi-Tech is committed to the integration of student learning, research and development by creating transformative learning opportunities that enrich the lives of our students. We strive to promote excellence and encourage student success by engaging students in the life of the campus community. The Department of Mechanical Engineering is one of the most dynamic and vibrant in college. The department offers widely acclaimed undergraduate programme in Mechanical Engineering. It also offers postgraduate programme (M. Tech), in Mechanical Engineering. The department is well equipped with state of the art laboratories and latest software for modeling, analysis and simulation. Department of Mechanical Engineering has developed specialized laboratories in the field of Automobile engineering, HVAC, Solar Photovoltaic and Solar-Thermal engineering. 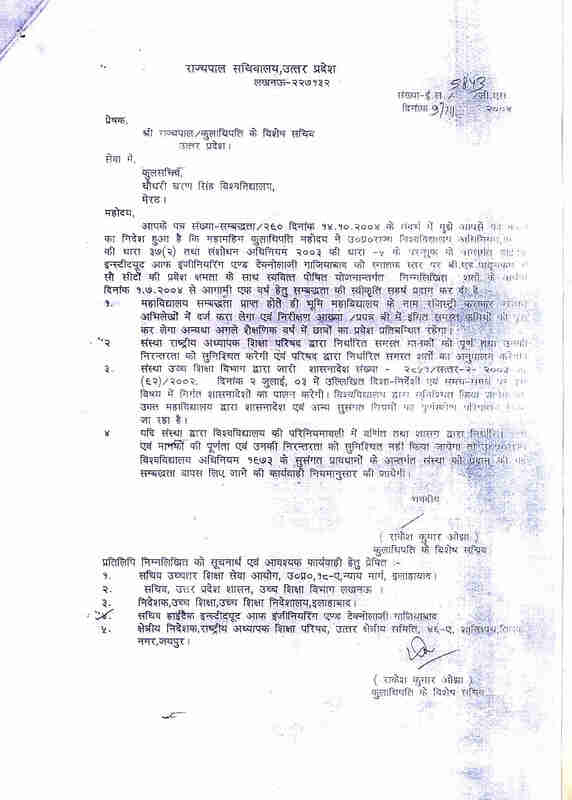 Department enjoys strong connect with core mechanical industries in Delhi and NCR; e.g. Nirmal Overseas, Assomac machines Ltd, Universal Electrodes, Malik Needles Pvt. Ltd and many more. Most of the students undergo sponsored projects in industries. Department is organizing an International conference “SOLARIS 2019” with the theme “Renewable Energy and Sustainable Climate” in association with, Jamia Millia Islamia, New Delhi during 7-9 February 2019.